There are as many chili recipes as there are Texans. To say that this recipe is the world's best may be a little difficult to prove, but it's pretty darn good! The secret to great chili is using the right ingredients and taking your time. You've got to let it bubble away for several hours to get the real experience. I think another often overlooked secret to this dish is homemade chili powder. Store-bought chili powder is too aggressive, and I don't much care for the taste. Make your own by combing three spices, and see how much better your chili tastes! That's it. Just mix it up and you've got a great homemade seasoning that's going to make a big difference in your next batch of chili. I'm going to give a recipe for a Texan style chili. 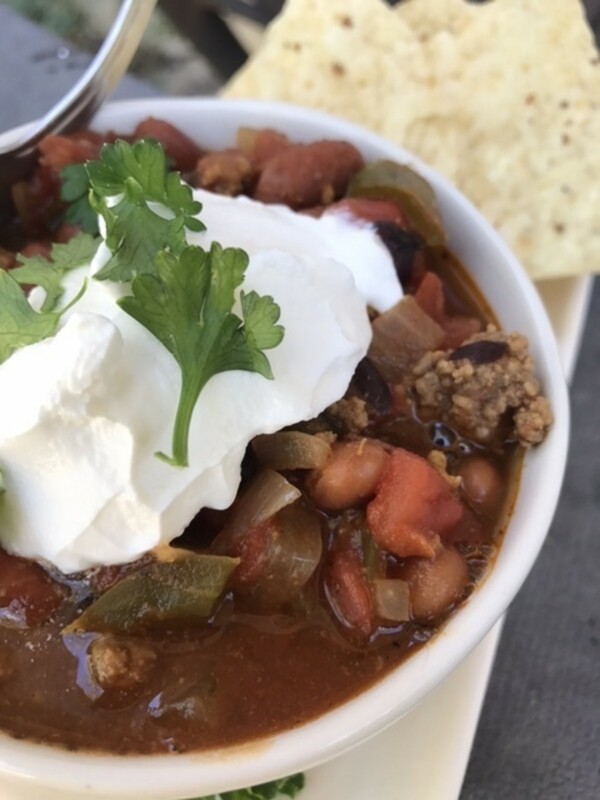 Now, a lot of Texans might say that true chili should never include beans, and I can't help but agree with them—but this is pretty good, and using black beans makes the recipe a whole lot healthier, not to mention a lot cheaper! It may seem like this recipe has a lot of directions, but it's really quite simple, and most of what you see is my effort to explain the hows and whys of what you're doing as you prepare the dish. This makes enough for a big family meal, with lots of leftovers! 1) Add a couple TBSP of oil to a large, heavy-bottomed sauce pot on medium heat. 2) Add the onions and peppers and sauté until slightly softened, for about ten minutes. 3) Add the chili powder and stir for about a minute. Then add the garlic and stir for an additional 30 seconds. 4) You don't want the garlic to start burning, so after the garlic is ready, immediately add in your chopped tomatoes. 5) Transfer everything out of the pot into another pot or bowl as you get the beef ready. 6) Now, add a couple more TBSP of oil to your saucepan on medium heat, sprinkle salt and pepper onto the beef, and add about half of it to the pot to brown. This is one of the most critical steps on the road to great chili. You want to take your time and get that beef nice and brown all over. You want it brown, not just grey-cooked looking, as that deep brown gives a lot of beefy flavor to your chili. Keep the heat moderate and just keep at it. The rest of the chili cooking is effortless, so it's worth it to spend the time here. Repeat with the second half of the beef. 7) As long as the bottom of the pan has not burnt (By cooking at medium you should be fine. That crusty stuff on the bottom is like chili gold!) add all the stuff you just put into a second pot or bowl back into the cooking pot. 8) Add about a quart of water to the pot and set the heat down to low. You want to see the chili just barely simmering away. 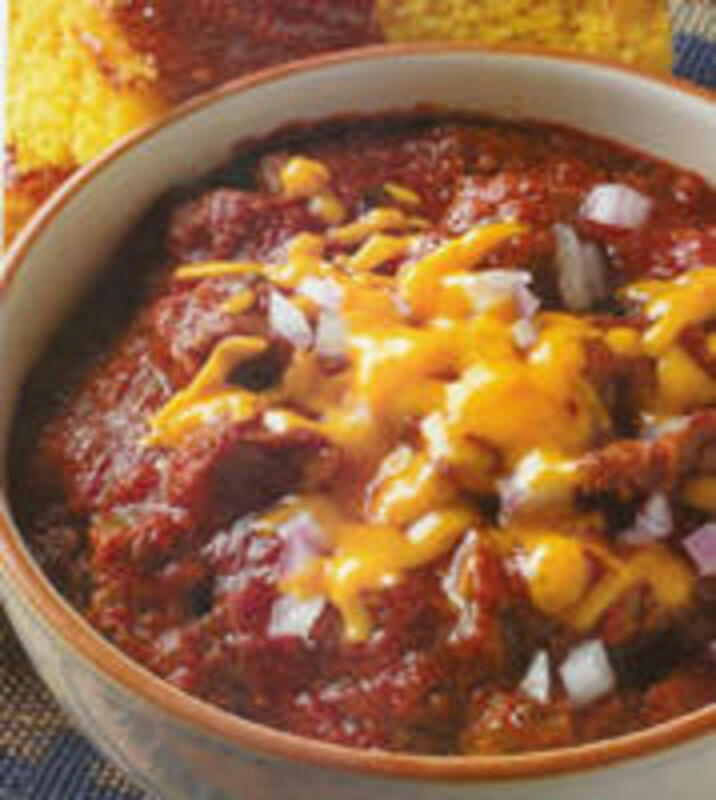 You want to get beef so tender that it literally just melts apart into the chili, and the secret to that is "low and slow!" 9) Every hour or so, check to see that there is enough water to just cover all the ingredients. This chili recipe takes a while and you'll want to keep this simmering slowly away for about 6 hours, but there's really no effort required (and what's better than a Sunday afternoon spent watching football with the smell of your chili perfuming the house)? 10) After you've been simmering for about 4 hours, add the cooked beans into the chili, and keep that the pot trucking away for another couple of hours, stirring occasionally. 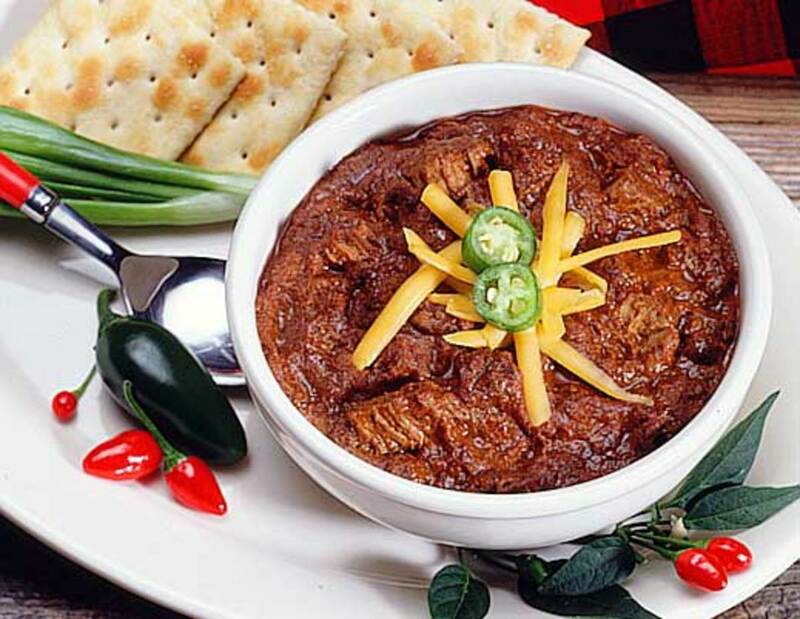 11) ou'll know it's done when it looks like real Texas chili! It should have a uniform mixture. You won't see bits of beef and bits of tomatoes and bits of beans. You'll just see your reddish brown masterpiece! 12) Now you're ready to season! Add about 2 tsp of salt, black pepper, and as much extra chile as you'd like. Keep tasting it and adding more salt until it tastes like it should. You can also add a TBSP or two of sugar if you think it's too sour. If you think it needs more of a chili kick, add more chili powder by the tsp until it's where you like it. Great chili is all about harmony and balance. You want a perfect union of flavors, so nothing should be too dominant. This chili recipe is a great basic chili, and once you make it once, it might become your family's new favorite! 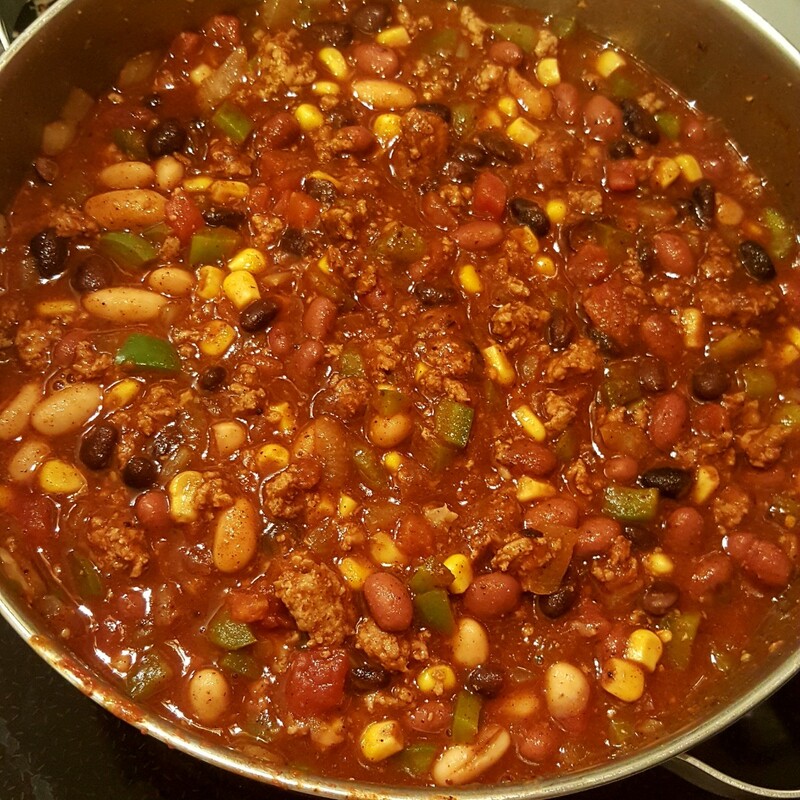 This chili is a huge hit with me and my family! I have been making it this way for four years now! I've always used minced beef to make chili. I think it would be better as you suggest - thanks for an interesting recipe. I am adding this to my Recipe Index for HubPages. From Australia. Huge Texas taste recipe. Thanks for the effort of getting it out there. Looking forward to cooking this for six hours and into it with fried polenta. Many thanks. Wow... I'am soo glad I found this recipe. 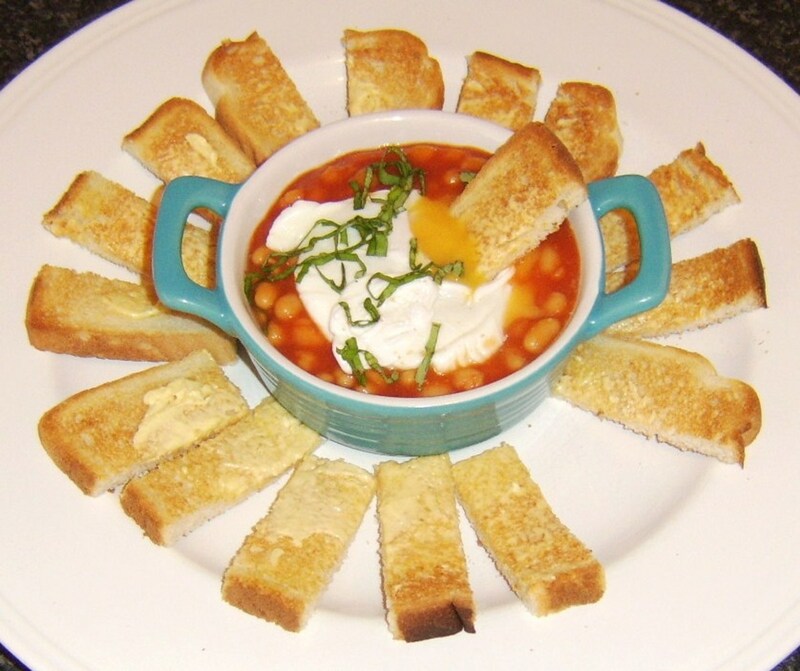 Finally, a recipe that uses fresh tomatoes :-) Thanks for taking the time in sharing your receipe to us. This was one of the best dishes I've ever made. How long will Texas Chili keep unfrozen in the fridge? This recipe sounds great. I have my beans soaking right now so I can make it tomorrow. Some people mentioned adding cinnamon to their chili. I don't think I'd do that but I do know that a good combination is; cinnamon rolls (preferably homemade) and chili. Try it some time. It might sound strange but it's amazing. Or as a quick sub you can make cinnamon toast. Yum! Thank you for sharing your recipe, I've never made chili completely from scratch. I cooked the beans overnight, kidney, pinto, and pink beans. Almost 4 cups - knowing that I would be removing a third for the vegetarian batch. My "beef batch" just had the beans added,and should be ready in two hours. The vegetarian version has been finished for a couple of hours, and everyone keeps snitching at my daughter's dinner. My chili powder version was red pepper flakes, ground cumin and cumin seeds (to equal 2 tbls), and dried oregano, and a grind or two of chipotle pepper. This chili made my girlfriend's farts intolerable. I love your recipe. I used minced meat, because I couldn't cook chili for so many hours as in the recipe. I'm sure it'd taste even better if I cooked it longer than I did. Anyway the result is fantastic. All my ingredients were organic. Thank you for inhancing comments. I'll keep them in mind in my cooking. Omg. Yes this recipe awesome ty so much!! I have never made chili this way, though I love chili and I do make it. Gotta try this recipe...worthy of being cooked on Diners,Drive-ins and Dives! This version looks delicious, thanks! Very entertaining to read as well. made this chili for a chili cook-off and won. cooked chili during day, put it in refrigerator overnight and then reheated in crock pot the next day. on second day, added two additional tablespoons chili powder and one tablespoon black pepper. also, I didn't use the recommended quart of water since there was so much water from the 7 pounds of tomatoes I used. thanks for the great recipe and instructions! That's great Angel - your version sounds tasty! Thanks for the recipe. Made it yesterday and it came out fantastic. I used pinto beans cooked in ham hocks to give it a hint of smoke. It came out great! I enjoyed your blog especially the good tip on chili powder. I'm going to try it tonight in fact. Hope you and yours have a great 4th of July Celebration! Hi Don - your chili sounds great - thanks for the comment! I stumbled upon this recipe and absolutely loved it! added two pounds of ground beef around the same time as the beans, and i also added some corn, and at the start, when i added the water , i also added a 1/2 cup molasses. Thank you for letting me know about your chili success Tanya! Great Chili! My family loved every bowl. Making my 2nd pot right now. You are welcome Augusto! Glad to hear you enjoyed the chili. Awsome chili! I just enjoyed one bowl of the best chili ever. 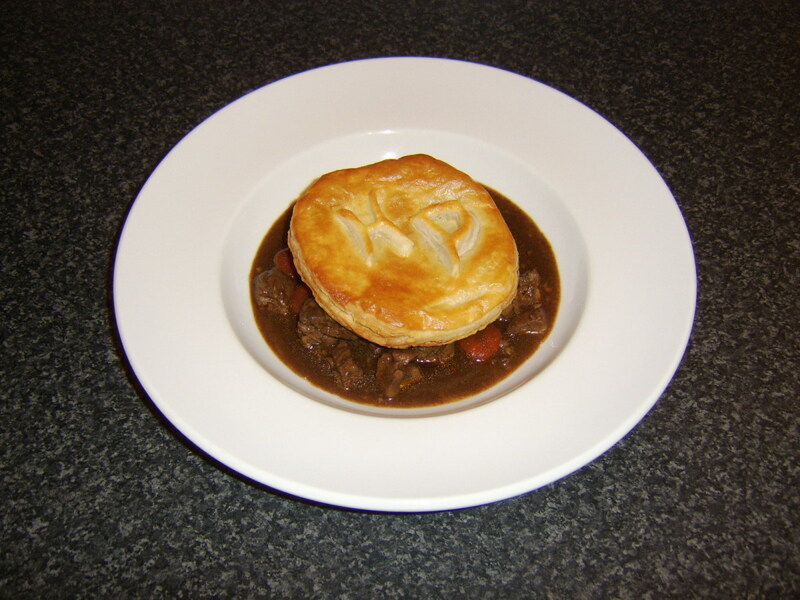 Hey thanks John Lee for sharing your recipe. I sometimes use a mixture of fresh and dried chili peppers in the chili, but there is no real substitute, in my opinion, for at least some dried chili powder - it has a taste that isn't replicated by fresh chilies. Of course, that's only my opinion, try it for yourself and see! I am not a fan of chili powder either, I like the idea of homemade or, even better, why not try using fresh chili peppers. I haven't tried this but I am about to. I figure you could use different hot peppers depending on what flavour you like or how hot you like it. Kidney beans will work too - I just happen to prefer the flavor of black beans. Hope you get a chance to try it out soon! 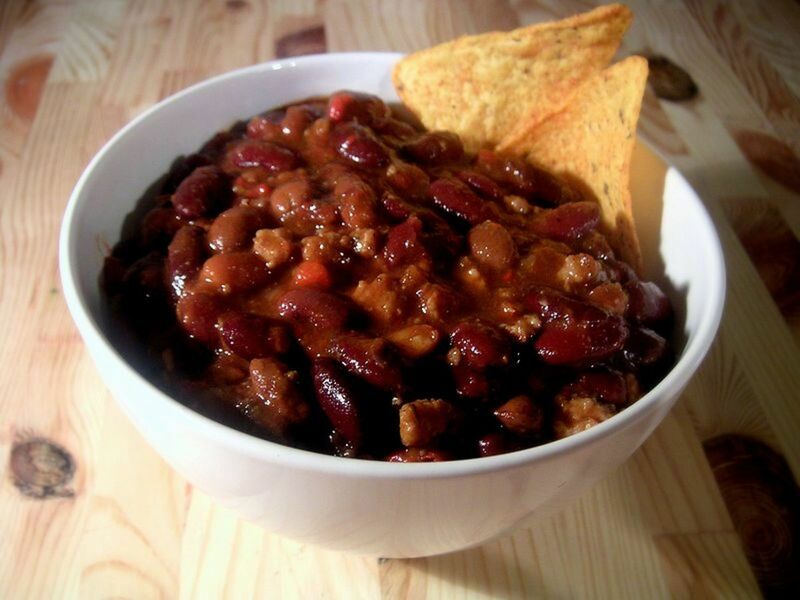 Loving this chili recipe (good touch with the black beans...I usually use kidney beans)...Although it made me very hungry while reading it! This chili sounds great, I'll have to give it a try some time. Black beans instead of kidney beans sounds like a good idea, though recently I've been making my chili Texas style--with no beans. Do you think that this recipe would taste the same if I use pinto beans instead of black beans???? 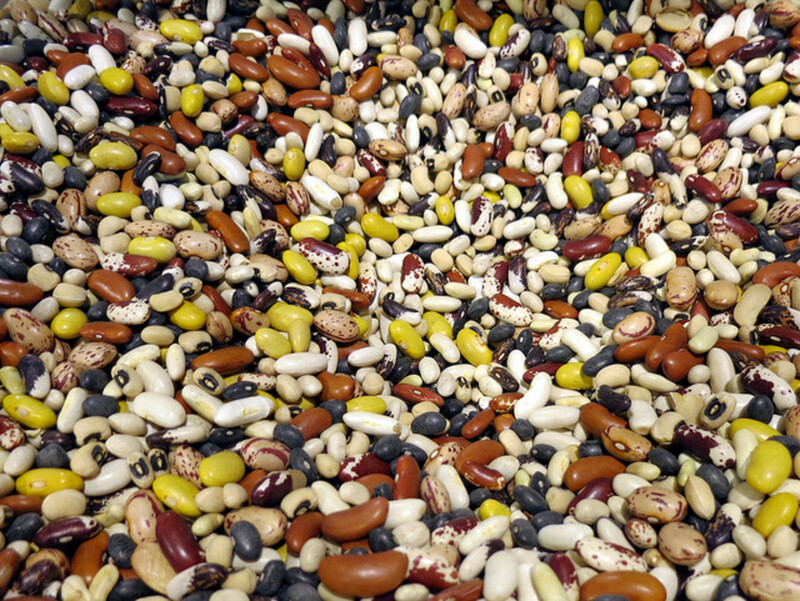 ?I made pinto beans and i am going to try it and let everyone know if its good or not. Chili is such a wonderful comfort food. The best thing is that you can personalize it to your tastes. I love chili. Thanks for the great recipe. Once in a while I will had some cinnamon, chocolate or peanut butter for a change. Most people really like and comment on the cinnamon. Sounds like a great recipe, definitely going to try this, nothing better than a nice big bowl of chilli! I had a friend who was married to a Navy Lt. He had a Texas chili recipe, and this sounds a lot like it. He always had three meats in his. Looks like a perfect recipe for a cold winter night. Sounds like another winner! I've bookmarked this page, it sounds absolutely yummy. This recipe sounds great, I am making it today. I have my beans soaking now, but am using a mixture of kidney, black and pinto beans. 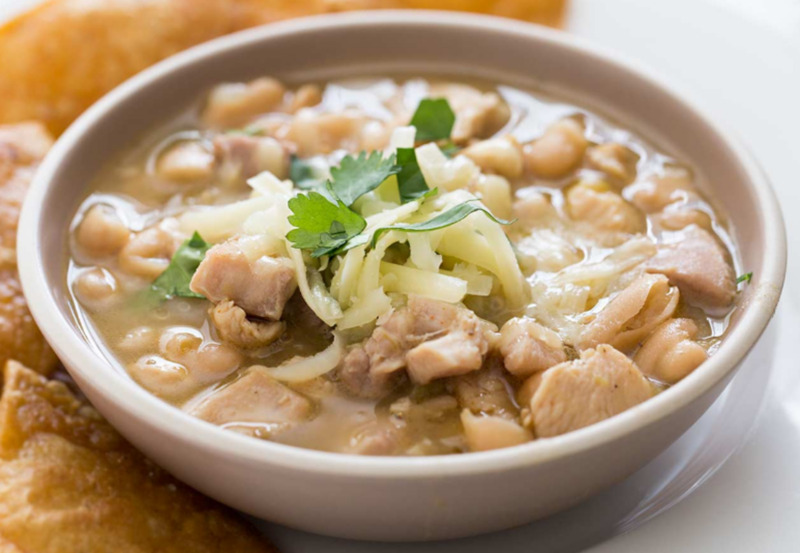 We like the beans in our chile. I wrote down your recipe for the chile powder and will try it. This is the first recipe I looked at for Homemade Chile from Scratch, made with dried beans, and I am done looking. Thanks! Thanks John for the information on cooking the beans. I was wondering why my dried kidney beans never seem to soften in the chile. I'll try cooking them fully before I made the chile. Chile is perfect with cool fall weather! Good ideas for the modifications... always fun to perfect that chili recipe! I made your chili yesterday and I love it! It took me about ten hours to cook but it came out great! I would suggest using more meat (maybe one or two more pounds) and more chili powder. I also added 1lb. of Italian sausage. I also added a dash of cinnamon and some choped green onions and about two cups instead of one of the black beans. My batch came out a little more liquidy than I normally like my chili. This a great recipe and I give it a 10. Thank you! Thanks Angela...and since by my calender the first week of the NFL equates to chilli season, it's time to start thinking about it once again!!! Sounds like a fantastic chili recipe, and thanks for the homemade chili powder. I think that you&#39;ll really notice an improvement by making your own. I think that store bought chili powder is too aggressive, and never seems to blend in well with the overall tastes of the chilli. Ooh. I like your tip on homemade chili powder. We&#39;ll have to try that next time we make chili. Thanks! I like the idea of making my own chile powder.